After the usual recapping, we cut to the race against time. Mi So and Na Young are both rushing towards Hae Ram. Mi So calls up the woman who found Hae Ram and asks to speak with her. Mi So promises her daughter that she will be there soon. She then instructs Hae Ram to be the good girl she is and stay put. Meanwhile, Min Jae is rushing off, too, after getting his spare key. His GPS is unfortunately not working and when he tries to call his mother she doesn’t answer. This doesn’t bode well. We then cut to Myung Ja in her office talking to the shaman who says it doesn’t matter how compatible Mi So is with Min Jae if she is not compatible with Myung Ja. Um…it’s more important that she’s compatible with her husband than his mother really. Myung Ja sighs. How can she end this relationship? It’s ordained by the heavens so it will not be easy. The shaman then tells her he’s been fasting and praying and Hae Ram has started to show up in his dreams. This means Myung Ja will receive good news soon. She should go to his temple later. Ko then comes in and tells her its time to go to the Incheon factory. The evil Na Young gets to the area first and calls up her mother to meet. The two spy on the couple and the sleeping Hae Ram. Of course, Na Young’s mother is not happy with the mess Na Young got her into, but of course, Na Young blames everything on her mother. She then spots the dog and tells her mother to do everything she requests. Her mother then sneaks into the camp and lets the dog loose and the couple go chasing after it. One of them should have stayed with the little girl. Bad people. Na Young then goes into the tent and takes out the sleeping Hae Ram and leaves with her mother. It’s at this time that Mi So and Min Jae arrive and run into each other. The two then go off in search of the couple. They find the tent and the couple have just arrived with their puppy. They tell the Lees their daughter is in the tent, but she’s gone! Where is she? The couple are shocked as well. Min Jae immediately accuses them of lying, but they didn’t since both Mi So and Min Jae spoke to their daughter. 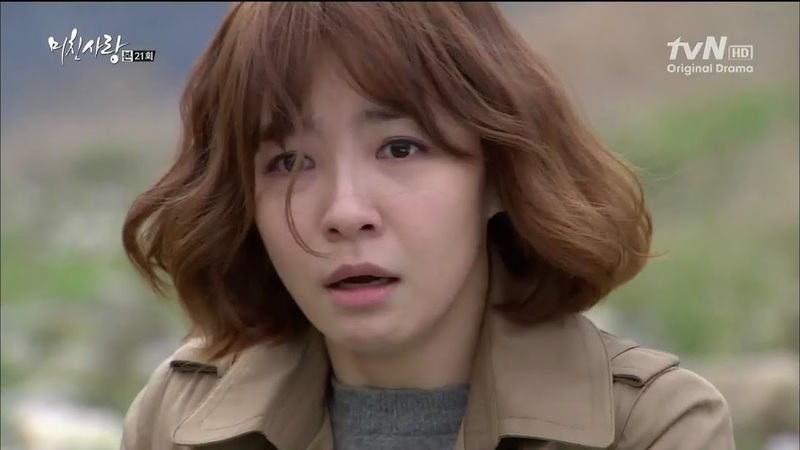 The woman then worries that Hae Ram woke up and tried to cross the river to get to Seoul again. Min Jae grabs the man’s collar and yells at him for not keeping an eye on Hae Ram. Of course the couple aren’t happy about this…but Min Jae is right. They should have. BOTH of them didn’t need to go chase after the puppy. No offense to animal lovers out there, but a little girl’s life weighs a little more than a puppy’s to me. Mi So pulls him off the man and tells him they need to quickly search the area. Na Young’s mother keeps complaining about the mess her daughter created. What can they do now? Na Young stops the car and takes some of Hae Ram’s things. She wishes to stage the scene to make it look like Hae Ram was swept away in the river and drowned. This will buy her time. Na Young’s mother is livid. How can her daughter do something that black? It’s like cursing Hae Ram who is perfectly healthy. Even if Na Young’s adopted mommy wasn’t the best mother…she at least has a set of morals in regards to children. Even though she helped Na Young for the money (which she regrets taking now), her daughter has committed the most atrocious crime by kidnapping an innocent child. Does Na Young not plan on returning the little girl at all now? Na Young yells that she can’t possibly do such a thing since the situation has become like this. More scolding about how no child deserves this punishment just because the family mistreated Na Young. The evil witch still insists that she is right because her mother has no idea how Mi So destroyed her life. Slap her. And keep slapping her until she gets some sense knocked into her head. Her mother pleads with her to change her mind, but Na Young refuses. She then reminds her mother that it is over for both of them if Hae Ram is returned. The younger woman then goes off to a bridge to throw Hae Ram’s things over it. Below you can see Mi So and Min Jae rushing around looking for their daughter, desperately screaming her name. Na Young then throws the stuff over the bridge and tells Mi So to look well as this will be her last gift to her. Min Jae then spots Hae Ram’s doll in the water and rushes over to it. Mi So runs up to him screaming her daughter’s name. She then spots the little gir’s shoe floating. Mi So asks why Hae Ram’s things are there but there daughter isn’t. She then starts screaming and trying to rush into the river. Min Jae holds her back until she collapses. I don’t care what Na Young believes, she has gone way beyond the necessary amount of revenge. 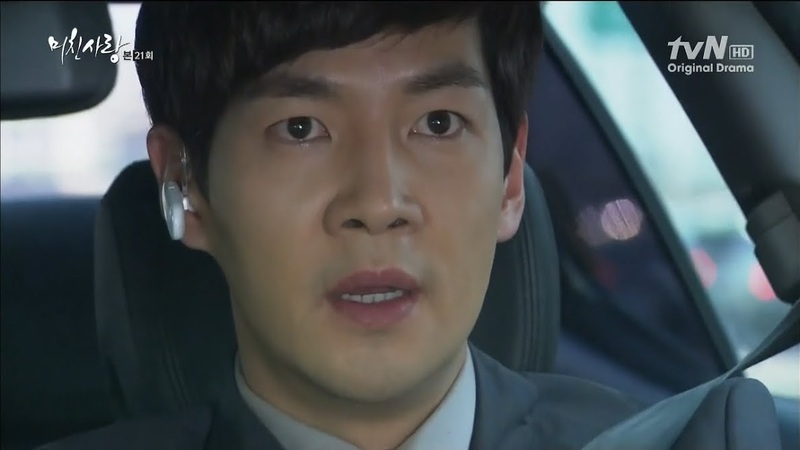 Hae Ram sits in Na Young’s car with her mother and cries for Mi So. NY’s mother then has to pee and Hae Ram pleads to go with her. NY’s mother does agree to this and as she squats down Hae Ram, who is quite intelligent, uses the opportunity to make a run for it in her stocking feet. 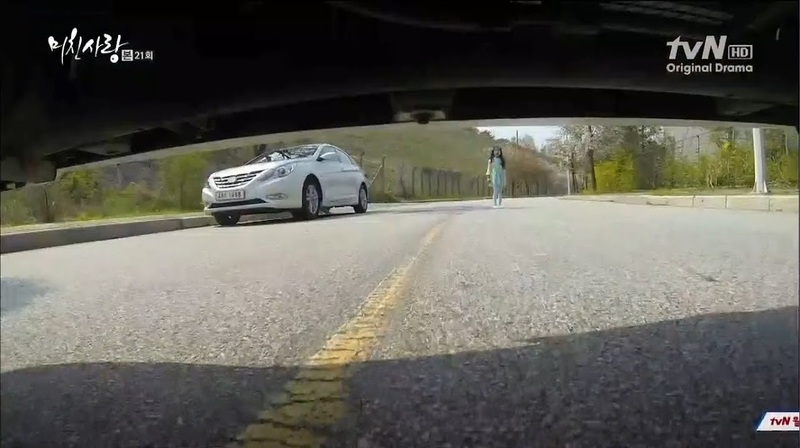 Unfortunately she runs into the path of an oncoming truck. Na Young arrives and she and her mother scream as we hear squealing breaks. T_T We then cut to see Yoon anxiously trying to reach Mi So as he’s got a bad feeling. Mi So is in the hospital being watched over by Min Jae who gets a call from Myung Ja. She doesn’t let him get a word in edgewise. She keeps talking and talking and tells him about the good news the monk said. Min Jae fights back tears and finally manages to tell her he thinks something happened to Hae Ram. This crying scene seems a bit more believable, but it still has a bit of fakeness to it. Myung Ja demands to know what happened and Min Jae sobs out the story. Shocked (I HATE her shocked expression and her angry expression…I just don’t like her), she drops the phone. Again, back to the Yoon household. Moon Do just can’t shake the fact that something is wrong. 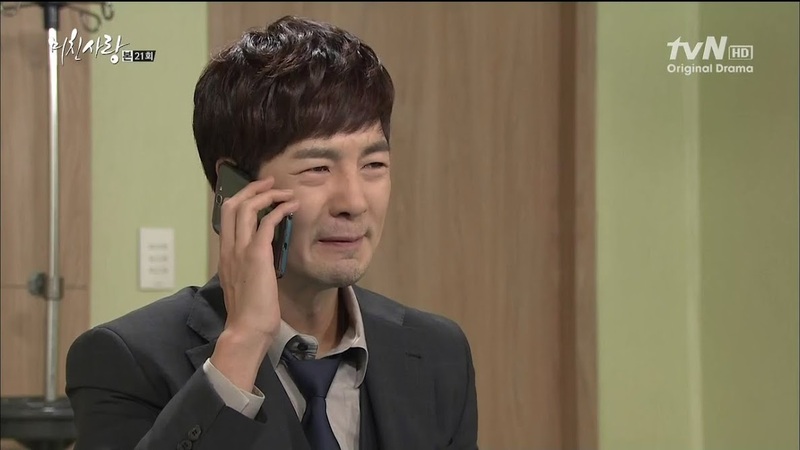 Chan Ki tells him to try calling Min Jae instead of Mi So. Yoon finally gets through and he gets the news this time. Moon do drops his phone and his face gets purple. He asks for water and Chan Ki gives it to him and demands to know what happened. Yoon doesn’t reply and hands over his phone. Call Jong Hee now and get her car. WHY? 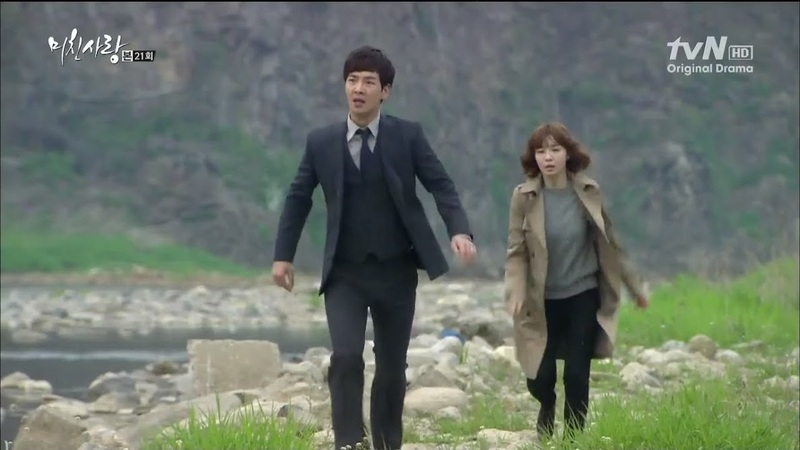 Yoon then says that Hae Ram fell into the river. More shock. We get a break from the Hae Ram melodrama to run smack into the Oh family melodrama. Hae Ryung is finally happy and acting like a good wife since Kyung Soo came home early. This in turn makes Yoo Jung happy…until the yelling from the living room reaches there ear. 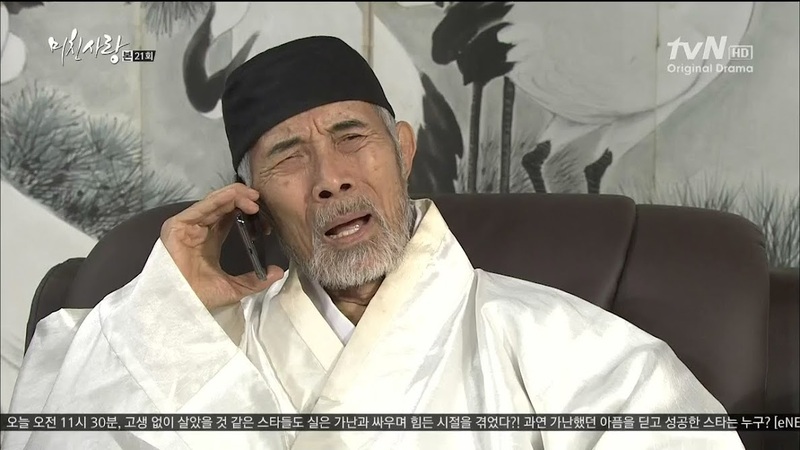 Kyung Soo returns the membership saying it’s too extravagant which earns him Tae San’s wrath. He won’t even let Kyung Soo explain and dresses him down for being too good for him now. That’s not the case. Kyung Soo then excuses himself and goes to his room followed by his wife. Yoo Jung then tells her husband he shouldn’t have gotten such an expensive gift without consulting Kyung Soo first. Oh then wonders if he should kick the kids out. Hae Ryung then goes and starts demanding to know what’s wrong with him. Does Kyung Soo have something against her father? Kyung Soo says that Oh’s gifts are burdensome and he just can’t accept them anymore. Hae Ryung doesn’t get it—it’s just a gift. Does this mean Kyung Soo doesn’t like her father or living with her parents? Kyung Soo assures her that isn’t the case and asks her to move so he can go out for a walk. Where? Kyung Soo says he just needs fresh air. Hae Ryung tells him not to go out since she hates it. If he goes, can’t she come too? Kyung Soo just wants air—give him some space. He leaves and Hae Ryung screams at his retreating back and throws a pillow at the door. Kyung Soo goes back to his office where Oh’s and Yoon’s words keep replaying over and over again. Of course, he always goes back to Mi So’s words, telling him that he is a good man deep down. Kyung Soo then tries to call Mi So, but her phone is off. This shocks Kyung Soo. There is no way Mi So would have turned off her phone—what happened? Mi So is lying in the hospital bed dreaming that she is running along the river and finds her daughter. She calls out to Hae Ram to come to her since it is dangerous. Hae Ram cries and apologizes to her mother—she has to go. Mi So pleads to go with Hae Ram because she can’t live without her daughter. Hae Ram apologizes again and says she doesn’t want her mother to come with her as she will go alone. Hae Ram then walks into the water and Mi So screams out her name. Meanwhile, a visibly shaken Na Young arrives at her apartment. She keeps replaying the scene of the truck coming straight at Hae Ram. 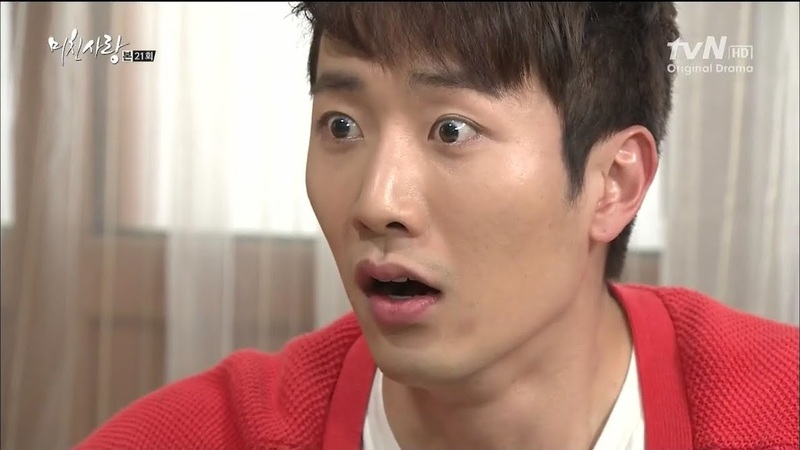 The truck swerved…but with Na Young’s reactions…it looks like little Hae Ram might not have been spared. Well…it serves Na Young right…but at the same time. Sniffle. I had hoped against hope that Hae Ram might end up getting saved and end up at an orphanage somewhere to be found a few years down the road when Crazy Lady got what she deserved. Min Jae and Officer Choi go into Mi So’s room where Choi explains he has the local police searching the shores for any evidence of Hae Ram. Min Jae snaps that the police aren’t doing a good enough job since there is no news of Hae Ram’s whereabouts and that a fishing couple found her before the police. Min Jae then says there is no proof his daughter drowned. That’s true, so don’t give up hope. Enter Myung Ja who comes in and asks what happens. Did her granddaughter really drown? Nothing is certain. Choi then leaves to take a phone call and Myung Ja collapses onto a seat. Min Jae rushes out to get a nurse. 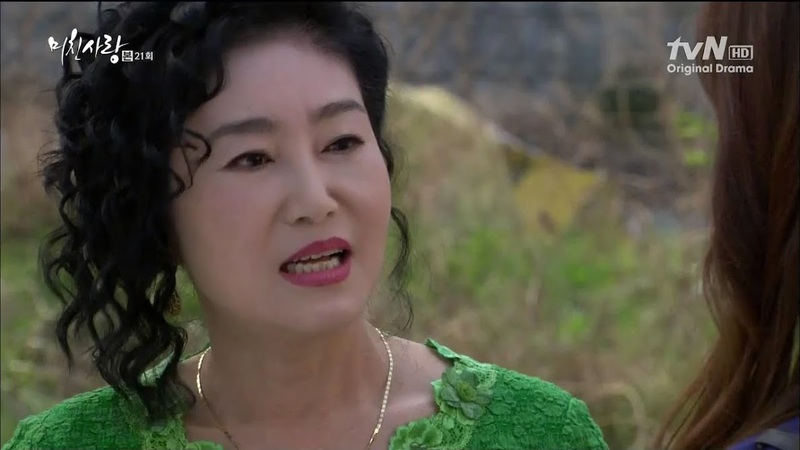 Crazy Myung Ja recalls the shaman’s words as she looks at Mi So. She then recalls all the recent bad events with Mi So. Those events don’t make me pity Crazy Mother at all, only her poor daughter-in-law. The enraged Myung Ja then gets up. How could this girl end up as her daughter-in-law? How could she let Min Jae marry Mi So? Myung Ja vows she can’t accept Mi So anymore with how she destroyed Min Jae’s and Hae Ram’s lives. We cut back to Mi So’s dream about finding Hae Ram’s doll. When she wakes up, Myung Ja is strangling her and telling her to disappear as everything will be better if she is gone. End episode. This whole show is fully of CRAZY people. Is there any sane ones? Well…if they aren’t crazy, they are evil sadistic b*stards or selfish immature b*stards. Sigh. Na young and Myun Ja!!!! I swear!!! I just hope Baek and Kyun Soo figure out things fast enough. I was livid after this episode! Again?!! Oh please, drama gods!! I want some serious revenge!! On both of them but especially Na Young! Death is too good for her! Agreed. Obviously suffering as a child wasn’t enough for her. She needs some serious suffering through whatever Baek can cook up because death is far too nice an end.